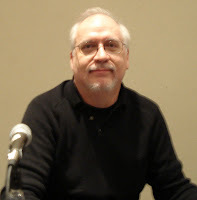 Jiminy Cricket said 'When you wish upon a star your dreams come true' and no one in comics knows that more than J. Michael Straczynski. In the first post of what DC's Source Blog promises will be a week of revelations, the publisher states that in 2010 JMS, an unabashed fan of 'The Man Of Steel' will finally get his wish; to script Superman... kinda. exactly Kryptonian rocket science, what makes this project unique is that it will take place in a series of original graphic novels, rather than in a traditional monthly comic format. With two novels per series a year, BATMAN: EARTH ONE taps writer Geoff Johns and artist Gary Frank, to explore how a grief stricken boy turns into the night’s ultimate avenger, while SUPERMAN: EARTH ONE lets JMS and artist Shane Davis take Kal-El. and find what it takes to be a ‘Man of Steel’ in todays world. The new novels, not only give greater exposure to the comics medium, for existing comic fans who can't afford all the current monthly 'Bat' or 'Super' books, they offer the ability to buy fresh new stories of the heroes in trade format, without having the story or repercussions spoiled for them online in the months in-between. "It's about respecting the character and his origins. 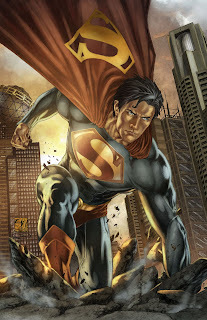 Especially for me, since Superman has always been my number one icon growing up as a kid. Coming from poor surroundings and circumstances where everybody says "forget this idea of being a writer, guys like you who come from nothing always end up at nothing," Superman was what I held onto, the idea of someone who could do anything." See - this is his moment - and there's no way as a fan, I'm not going to be there for that. Awesome artwork! I totally appreciate where DC is coming from. I really dislike finding big holes in my understanding of storylines - especially when major events occur in other comics but there was no warning. I am so looking forward to the Bat! If they can get these books in front of new readers, and not just the same audience that already buy comics, then I think they've got a shot with this. This should be great. A nice way to get new readers in! I totally appreciate where DC is coming from. I really dislike finding big holes in my understanding of storylines - especially when major events occur in other comics but there was no warning.thanks for sharing. Thanks for the posts guys, and welcome to It's A Dan's World Stephen! I think DC is putting in an awesome effort to attracting more readers. Wednesday Comics, bringing in pulp heroes like Doc Savage, getting each franchise chugging along on it's own steam, and now this direct approach to the bookstore market. If the pro-activeness keeps up DC could well overtake Marvel for the #1 spot.